Right now I'm all about my Daddy. Mom says it's a phase, or maybe she's just hoping it is. See when I first came to live with mom and dad, I really bonded with mom, and I think dad felt out of the loop. Mom made sure dad took me to classes and spent lots of time with me, and it worked. I'm soooo daddy's little girl (er..hermaphrodite), and I'm working that angle to my advantage. See dad is a sucker for my orbs, just one look and he sneaks me treats when he thinks mom isn't looking. When I want to snuggle on the sofa, I just plop on his lap. When I want to play, I bring him my favorite toy (my flappy) and all is right in the world. So while I'm in my "daddy phase" as mom calls it, I still love her tons and will sucker her into giving me a treat too. Sometimes humans are sooo funny. So who do you favor more? Your mom or dad, a grandma or grandpa maybe? First it's Izzy. I am a Mommys girl. I love my Mommy and my Daddy...but I just have to be touching my Mommy at all times if I can see her. When she enters the room and ignores me or has to go out into the big picture window world it makes me craZy. Mommy is not working anywhere near as many hours as she has since Feb. but man o man she was really working a lots. She was even gone on the weekends sometimes and I gots stuck with Daddy. What??? Daddy is boring. (hee hee) But it was cool 'cuz we would naps a lots (hee hee). Now Daddy is gone more so hey...I got my Mommy more... Izzy. Whatever!!! It's Anakin! O.K. Don't laugh 'K. But Bella -I'm totally a Momma's Boy. Yeah I know. I can't help it. I love my Mommy!!! Don't get me wrong... I love my Daddy, but I love my Mommy. Daddy has new job he started in the fall and his hours are crap!!! He has an hour commute each way and doesn't get off until 10pm. So I am the man of the house!!! Daddy comes home and trys to take over, but I tell him I's gots it alls unders controls...hee hee... ~Anakin. 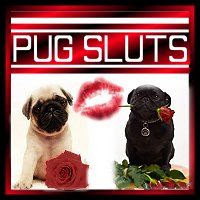 Bye Bye... From us puggies!!! You're lucky to have a dad. I just have a mom. And Dutch. I guess The Man is kinda like a dad and I LOVE him. LOVE him!! Whenever The Man comes to visit, or we visit him, I get so excited I cackle like some crazy bird. Can't help myself. LOVE him. It's Wilma first, naturally. You may or may not be surprised to know that I love me above all else. 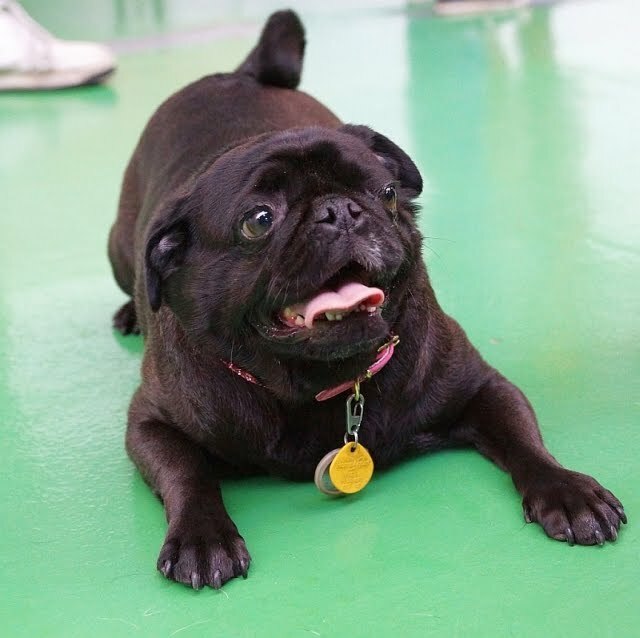 I am my own pug, and I do what I want. If I had to say who's next, it would have to be Dad. I was a gift to him from Mom after all. He makes the best spot to sleep in. When I choose to, it's usually his lap I sit in. But I listen to the Mom way better. I've got my Dad totally wrapped. Mommy picked me up from my last home and we bonded instantly, I wasn't that into the Dad at first, no men actually. It didn't take that long to warm up to him though. I always see a strong spark of love in his eyes when he looks at me, but he is not my mommmy, my mommy...now where is she? Here's Sluggo. I am 100% Momma's boy. I must be with her at all times. In the morning,I lay on top of her so she won't leave. She doesn't work a million days at a time like she used to. I am very happy to have her around way more. She says that will be changing soon, not if I have anything to do with it. Sequoia here...I loves Daddy!!! I am his little pugger girl no matters if he leaves me for 6 months I still loves him best! Mom finally forgave me for this by getting my sister Tuni. Tuni is such a Momma's pugger. She has to be with Mom 24/7. She follows her everywheres and freaks out if Mom goes into another room without her. Hi Bellatrix! This is a hard question. I love my daddy for eating and my mommy for sleeping. I really give them equal time so that neither feels left out. I don't know what I'd do without either of them. wow it seems that no matter what we love our mommies and daddies. Mom said she read somewhere that boy pugs love their moms and girl pugs love their dads...I think this may be true.